IS ANTHRAX COMMON AND WHO CAN GET IT? Anthrax infection can occur in three forms: cutaneous (skin), inhalation, and gastrointestinal. B. anthracis spores can live in the soil for many years, and humans can become infected with anthrax by handling products from infected animals or by inhaling anthrax spores from contaminated animal products. Anthrax can also be spread by eating undercooked meat from infected animals. It is rare to find infected animals in the United States. Cutaneous: Most (about 95%) anthrax infections occur when the bacterium enters a cut or abrasion on the skin, such as when handling contaminated wool, hides, leather or hair products (especially goat hair) of infected animals. 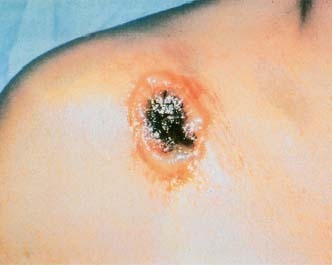 Skin infection begins as a raised itchy bump that resembles an insect bite but within 1-2 days develops into a vesicle and then a painless ulcer, usually 1-3 cm in diameter, with a characteristic black necrotic (dying) area in the center. Lymph glands in the adjacent area may swell. About 20% of untreated cases of cutaneous anthrax will result in death. Deaths are rare with appropriate antimicrobial therapy. INHALATION: Initial symptoms may resemble a common cold. After several days, the symptoms may progress to severe breathing problems and shock. inhalation anthrax is usually fatal. INTESTINAL: The intestinal disease form of anthrax may follow the consumption of contaminated meat and is characterized by an acute inflammation of the intestinal tract. Initial signs of nausea, loss of appetite, vomiting, fever are followed by abdominal pain, vomiting of blood, and severe diarrhea. Intestinal anthrax results in death in 25% to 60% of cases. WHERE IS ANTHRAX USUALLY FOUND? CAN ANTHRAX BE SPREAD FROM HUMAN TO HUMAN? Anthrax is not known to spread from human to human. Communicability is not a concern in managing or visiting with patients with inhalation anthrax. In countries where anthrax is common and vaccination levels of animal herds are low, humans should avoid contact with livestock and animal products and avoid eating meat that has not been properly slaughtered and cooked. Also, an anthrax vaccine has been licensed for use in humans. The vaccine is reported to be 93 percent effective in protecting against anthrax. The anthrax vaccine is manufactured and distributed by BioPort, Corporation, Lansing, Michigan. The vaccine is a cell-free filtrate vaccine, which means it contains no dead or live bacteria in the preparation. The final product contains no more than 2.4 mg of aluminum hydroxide as adjuvant. Anthrax vaccines intended for animals should not be used in humans. WHO SHOULD GET VACCINATED AGAINST ANTHRAX? Persons who work with imported animal hides or furs in areas where standards are insufficient to prevent exposure to anthrax spores. Persons who handle potentially infected animal products in high-incidence areas. Military personnel deployed to areas with high risk for exposure to the organism (as when it is used as a biological warfare weapon). The anthrax Vaccine Immunization Program in the U.S. Army Surgeon General's Office can be reached at 1-877-GETVACC (1-877-438-8222) or through their website. Pregnant women should be vaccinated only if absolutely necessary. WHAT IS THE PROTOCOL FOR ANTHRAX VACCINATION? The immunization consists of three subcutaneous injections given 2 weeks apart followed by three additional subcutaneous injections given at 6, 12, and 18 months. Annual booster injections of the vaccine are recommended thereafter. WHAT ARE THE ADVERSE REACTIONS TO THE ANTHRAX VACCINE? Where can I get more information about the recent Department of Defense decision to require men and women in the Armed Services to be vaccinated against anthrax? The Department of Defense recommends that servicemen and women contact their chain of command on questions about the vaccine and its distribution. The anthrax Vaccine Immunization Program in the U.S. Army Surgeon General's Office can be reached at 1-877-GETVACC (1-877-438-8222) or through their website.